Banana /Vazhakoombu stir fry is a very healthy veggie stir fry used mainly in the southern states of India.This veggie is very rich in dietary fibers.The actual combination what my mom makes it is with red chori beans or vanpayar but I have used black beans in it,you can modify it to red chori too.Both combo tastes great and makes a great mildy spicy side dish for rice.Hope you will all enjoy making this at home !! -Remove the outer 4-5 layers of banana bud/flower and wash it.Cut it fine into a bowl with water. -Drain the water completely ,then rub the coconut oil and salt with your hands.Keep aside. -Cook the soaked black beans or red chori whichever you're using with enough water and salt in a cooker for 3 whistles. -In the meantime,grind the ingredients listed coarsely so that it just holds together. -Heat oil in a pan and temper using mustard seeds,dry red chillies,curry leaves. -Saute the slit shallots till wilted.Add the chopped vazhakoobu/banana flower. -Add the coarsely ground ingredients. -Cover and cook for 10 minutes on medium flame. -Uncover lid,give a quick toss and cook again for 5 mins. -Adjust salt and then leave it open for the left over water to evaporate. -Stir fry is ready once the water is dried completely. * You can add 2 tsp of parboiled rice while tempering.Mom used to do that. * You can use 1/2 tsp of chilly powder instead of green chillies too. * The color of the stir fry is turned dark brownish because of thewater added of cooked black beans. looks absolutely delicious..love the way you presented it! 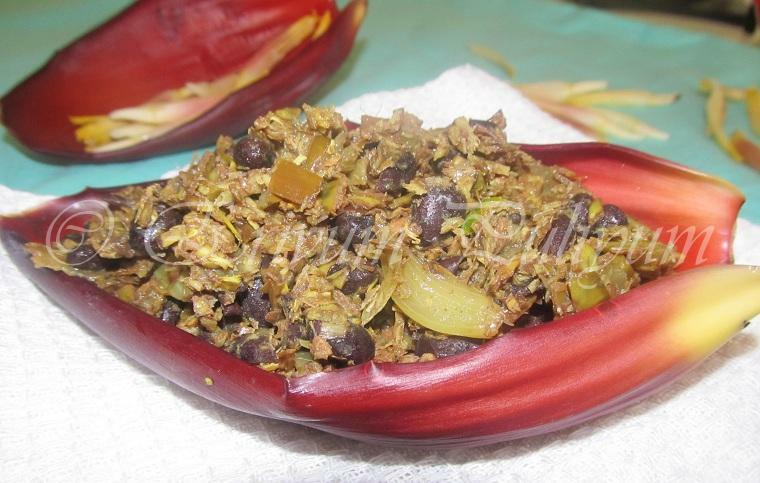 Banana Blossom itself a very healthy n nutritious one, in addition u added beans...sounds so filling...lovely recipe..
very very healthy thoran.nice and healthy combo. I love vazha poo a lot, but am super lazy to clean them and prepare them for cooking. Looks great. very interesting!i have never tasted this looks really yummy,a very healthy dish. Now I think I should come there,Juls...This is my fav...looks irresistible.. I Love vazhaipoo and do not get it here. Never tried adding any beans. Nice idea !! That's too nostalgic Julie..I love it's kind of raw feel.Addition of beans give it a real twist.Nice recipe. never heard of this recipe.. will surely try it..
Ah, brings back so many childhood memories! Healthy and nutritious thoran,love the addition of beans in it. Looks very nice. Have not had this for ages! Very interesting and delicious curry Julie, looks lovely. 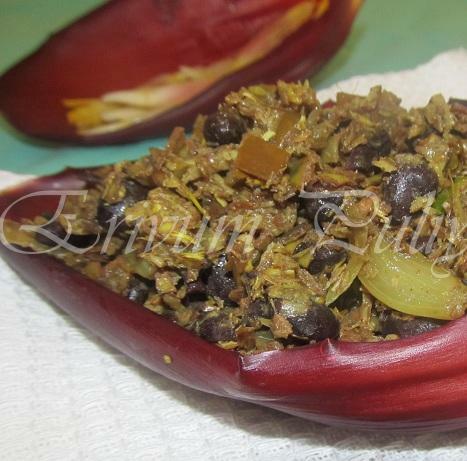 I never tried any dish with banana flower, love this awesome combo! very healthy and traditional curry.. thanks to visit my blog julie..
For me sounds very rare combination! Curious to taste it. What a different combo, looks awesome dear..